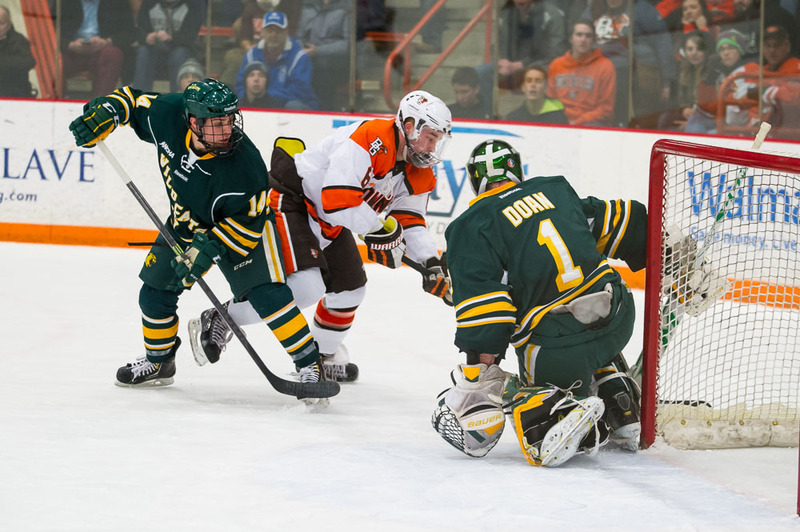 Bowling Green didn’t like its results against Northern Michigan last weekend in the Ice Arena. The Falcons lost two one-goal games, even though they held the lead going into the third period both nights. They’ll attempt to end their three-game losing streak this weekend when they travel to Alaska-Anchorage for a Western Collegiate Hockey Association series. Faceoff on Friday and Saturday nights is 11:07. The Falcons dropped a 3-2 overtime decision to NMU Friday, allowing the tying goal twice in the third period — the second coming with 1:56 only left. NMU then won the game in the extra period. On Saturday, the Falcons held a 3-0 lead with six minutes to go in the second period before NMU rallied. The Wildcats scored once in the second period and three times in the third period. Most of NMU’s goals in the series resulted from major mistakes by the Falcons. “We didn’t play that bad. If we play like that, we’re going to win more games than we don’t,” Bergeron said. BG held a 39-24 edge in shots Friday and a 23-12 edge during the first two periods Saturday. But the Falcons were out-shot by a 10-4 margin in the period Saturday as they had to kill off three straight penalties. BG still is 17-4-4 when leading or tied after two periods. LEADERSHIP: The Falcons remain a young team, with seven freshmen playing in each game against NMU. But sophomores, juniors and seniors made the key mistakes, including all three third-period penalties. The Falcons are 6-6-2 in their last 14 league games. THE END: The Falcons are guaranteed to play just six more games this season. In addition to the series at UAA, they host Alabama-Huntsville Mach 6-7 to finish the regular season, and they’ll also play a first-round playoff series. “We want to be confident at this time of year,” said Bergeron, whose teams usually play well late in the season. “The one thing we’ve been over the last couple years is confident at this time of the year and playing decent hockey at this time of the year. The Falcons need just one point to clinch home ice for the first round of the playoffs. The best-of-3 series are March 13-14-15. GOALTENDING: Bergeron said after Tuesday’s practice he hadn’t decided on which goalies will make the trip to Alaska. Junior Tommy Burke and freshman Chris Nell stopped just 39 of 46 shots against NMU, and were victimized by several soft goals. SERIES: The Falcons are 4-1-1 all-time against UAA, including a 2-2 tie and a 5-2 loss in Anchorage last season. TRAVEL: BG traveled to Anchorage Wednesday, and is scheduled practice in Sullivan Arena Thursday and Friday. The arena has an Olympic-sized ice surface (200 feet by 100, instead of the usual 200 by 85). The arena has a capacity of 8,700. INJURIES: The Falcons continue to have the usual bumps and bruises at this point in the season, Bergeron said. ATTENDANCE: The Falcons are fourth in the WCHA in attendance, averaging 2,760 fans for their 14 home games. Minnesota State leads the league (3,858), followed by Tech (3,412) and Bemidji State (3,363). No other schools are averaging more than 2,500. BG’s average this season is up from last season’s mark of 2,022.